The high school 80's movies get a fair flogging on here, but I was wondering what everybody's favourite College movie is. This is a truly fantastic movie and Dangerfield's best next to Caddyshack. I wont give the story away in case you have not seen it but perhaps introduce / talk about the characters. 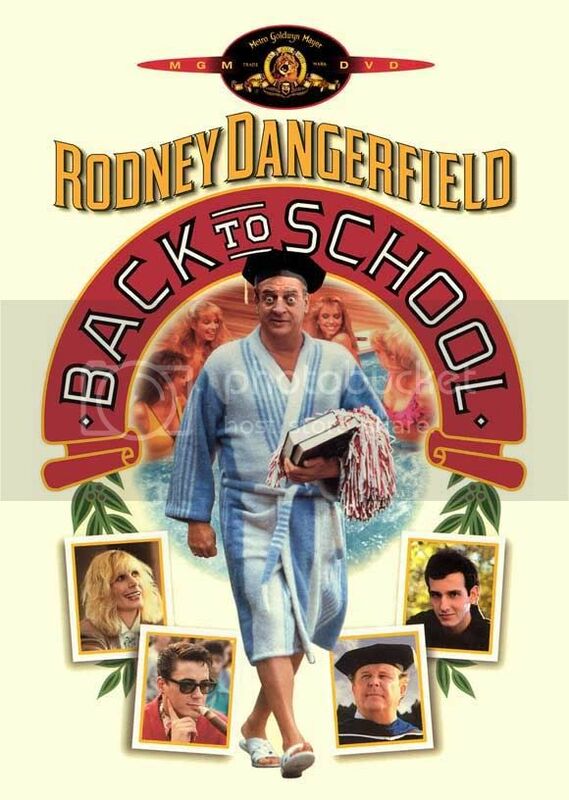 Thornton Melon (Rodney Dangerfield) - As always a rude and crude character with his typical derogatory one liners. Dangerfield's sense of humour is basic but effective and it embodies what most of us want to say but don't. Jason Melon (Keith Gordon) - Most people will know him as the ridiculous nerd / possessed rebel tough guy in the 1983 thriller Christine. He is great in this movie as the wanna be diver towel boy. Chas Osborne (William Zabka) - Chas is on the diving team (former national high school champion) and plays Jason's nemesis (Obviously). He doesn't fail to deliver and is the typical jerk as always. Derek Lutz (Robert Downey Jr) - OK, this is getting ridiculous. Another 80's legend in the movie. Derek is Jason's best friend (only friend) and is a very likeable yet strange character who doesn't mind annoying the footbal team. Lou (Burt Young) - Instead of playing Paulie and being in Rocky's corner he is in Thornton's corner as his limo driver / bodyguard / best friend. Lou is someone you don't wanna mess with but also has a soft side. Alright the list of great characters for this movie is just too long, however look out for characters such as Dean Martin (Ned Beatty), Professor Turgeson (Sam Kinison) and M. Emmet Walsh as Coach Turnbull. If you have not seen this it's a must see and if you have, watch it again! And what a release it was indeed.. it set the standard of how to create a quintessential look back at an 80's hidden gem. Real Genius. There are few seconds to it. I have not seen Night of The Creeps but I can't get into zombie flicks at all. I know my self I would not like it, not to say that it's a bad movie though. I knew Real Genius would get thrown in. I only saw this one in the last year or so. I thought it was pretty good overall. Val Kilmer is great in it. Being in Australia there are a few films that just don't seem to make it to our video stores. I think that's what it is anyway. Devo.. "Real Genuis" is an awesome choice. "This? This is ice. This is what happens to water when it gets too cold. This? This is Kent. This is what happens to people when they get 'too sexually frustrated'!" but i really like all the others mentioned too. "How come? Say it! Say it!" Nerds 2 was pretty good as well. Good job D. Real Genius is the stuff. Nerrrrrds!! I love the tri-lambs...in a Muffy loves Booger kind of way ha. Valley - great link..brought back memories..but I have one question...who the heck is Deb Foreman? ..
Ronnie.. ha.. you just gave me a VG flashback moment when Julie is discussing with her Dad whether she should pick Randy or Tommy. And her dad shows her those old pics..
btw.. according to the little thingy under your name.. it appears you picked Tommy. Totally agree on Real Genuis .. great soundtrack as well. So how about a fav tune from it? revenge of the nerds for sure "I thought I was looking at my mother's old douchebag, but that's in Ohio." valley - ha, it just dawned on me, both our sub titles refer to dating someone haha. but my prom date doesn't say alleged..more proof you are delusional on this whole Deb thing.. ha. muffy - i was waiting for you to see that!! i want the shirt that says High On Stress haha or Adadm's Atoms. donald gibb is the man, between the nerds movies and bloodsport i can not see why he did not get any more roles. Real Genius and Nerds came to mind immediately but just to mention something different I always like Soul Man w/C. Thomas Howell. Ahh, glad this thread popped back up! It's time for another 'Making The Grade' viewing! Ha, Valley got me to watch that movie and then was angry when I ripped Jonna Lee to shreds. Damn, you beat me to it! Amen to this movie. not many people on the rewind have seen it and its a great film - must see for all 80s lovers. "Making The Grade" is hilarious! I wish we could all watch the sequel though! How much fun would that be to suddenly find out that it was made by Dana Olsen, but never released! Just watched Making the Grade for the first time the other night. Another good 80's comedy. Now I have another reason to like Dano Olsen other than just for the Burbs. 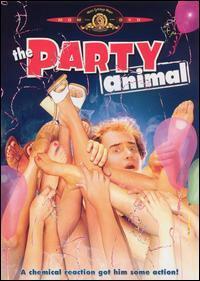 Hey speaking of college "Party Animal" a bit racy but kind of funny. making the grade and the party animal(one of my all time faves),two 80s comedy classics,both hilarious and both featuring great soundtracks. love living on the edge by shandi from making the grade - http://youtu.be/SR2lYbQyPOg . 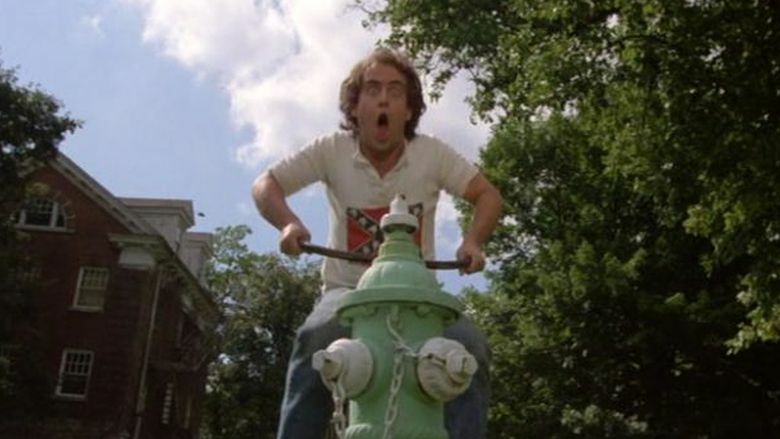 i'd have to say my all time fave 80s college movie is the party animal,it's so ridicously silly and o.t.t that it brings a big smile to my face everytime i just think about it. but they sure did make some classics-back to school,nerds,making the grade,loose screws,creeps etc.etc. Pacific Tech's smart people on ICE! This thread makes we want to watch several movies! Totally need to watch "Real Genius" again soon! Warrior.. that hilarious montage from "The Party Animal" to that cool tune by the Convertibles has me wanting to seek out the movie for another viewing. I've only seen it once as a rental and can't remember much about it. "Spring Break" is a movie that I want to add to the list as well. yeh valley i reckon you should definitely revisit the party animal,not only is it hilarious it has an awesome soundtrack to boot.